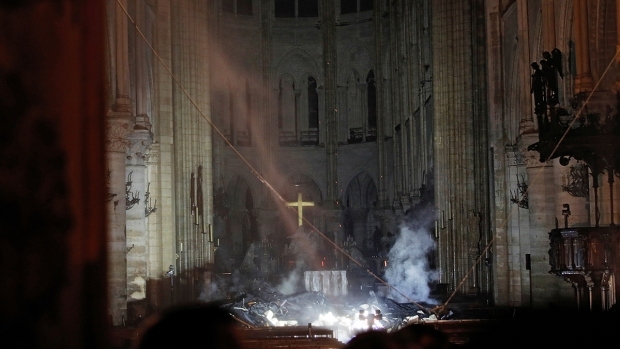 As Notre Dame cathedral in Paris recovers from a devastating fire, a Massachusetts city is remembering the eerily similar blaze that consumed their historic Notre Dame church nearly 40 years ago. The Fall River firefighters union tweeted Monday about the fire that destroyed the city's landmark Notre Dame de Lourdes Church on May 11, 1982, during a $1 million renovation project. A worker's blowtorch ignited dry roof timbers, engulfing the church's twin spires in flames. Gusty winds spread the blaze quickly. All that remained was the church's granite shell. More than two dozen other buildings were also destroyed. The governor called in the National Guard. The Fall River Herald reports the church, originally opened in 1891, was rebuilt in 1986. But it closed last August after years of declining attendance.